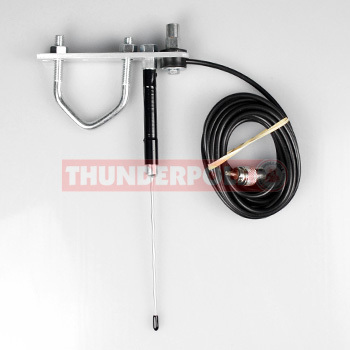 A CB Radio antenna mount designed to clamp onto thicker mirror arms than the standard mirror mount. It will fit onto bars up to 5cm (2") in diameter. It has a built in groundplane making it ideal for use on vehicles with fibreglass/plastic cabs, such as: ERF trucks, tractors, boats, etc. Comes complete with 3/8" Stud mount, RG58 cable (3 meters) & fitted PL259 plug. Will fit on arm from 26mm up to 53mm diameter.